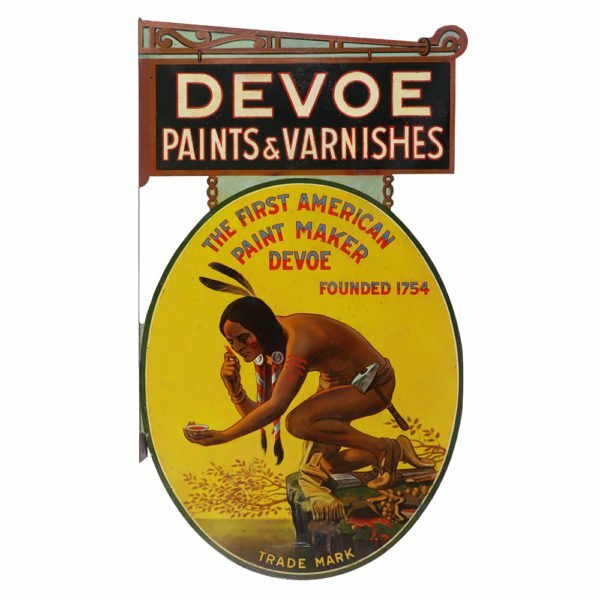 DeVoe Paints Sign: 25.25 x 15″ scarce and important, early, 2-sided die-cut tin litho flange sign for Devoe’s Paints & Varnishes. Clean, bright and displays very nicely when hung (as a C. 8.5/+), w/ some minor, fine speckling (note: examination under black light will show some scattered, well done professional restoration on both sides- especially in upper dark sign area (critical grade C. 8+/-)). Min. bid $150.